T o download the entire 2018-19 Educational Programs brochure as a PDF click here. Explore off-exhibit areas as you learn about the many careers that are involved in making The Maritime Aquarium a great place for visitors as well as for the animals that live here. 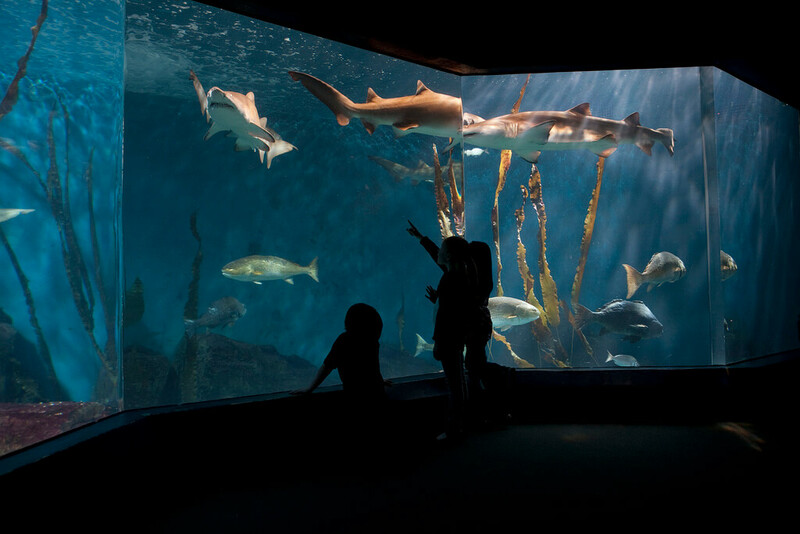 View the “Ocean Beyond the Sound” exhibit – with its 7-foot sharks – from above and visit our “Fish Kitchen” to learn how our aquarists meet the nutritional needs of more than 1,000 animals every day. Students not only learn about the behind-the-scenes operations of the Aquarium, but what they need to do to work with animals in a similar setting some day. One hour. Please note: from April through June, this program is offered only before 10 a.m. and after 1 p.m. In-House only: $120 for first or simultaneous; $110 for second & additional sequential. Learn the fundamentals of how we study animal behavior and why enrichment is beneficial to animals in human care. Students receive first-hand experience being creative in designing and building an enrichment object for animals using food and other sensory materials. Then students meet with a member of our Animal Husbandry department, who will put the enrichment in the exhibit. Students then complete ethogram behavior surveys, logging how the animals interact with their enrichment item. 2 hours. Cost is $350. Must be booked at least 4 weeks in advanced. Limited to two bookings per month. Simultaneous and sequential programs not available on the same day. Marine Life Study, Environmental Science, and Oceanography cruises, as well Coastal Resilience cruises, are all available as college-level presentations. These give students hands-on experience with scientific sampling equipment and methods. Contact our Reservations Department for details. Plus, our innovative vessel is available for research charters. For details, contact Nicki Rosenfeld at (203) 852-0700, ext. 2244, or nrosenfeld@maritimeaquarium.org. The Maritime Aquarium is proud to offer internships for college students in many different areas including education, animal husbandry, life support and more! An internship is a perfect introduction to biology and the challenges of working with live animals in an aquarium. Often, college students can receive course credit, fulfill degree requirements and gain valuable practical experience by working as an Aquarium intern. Our college interns work with aquarists, educators, volunteers, development staff and marketing staff. Previous interns have gone on to full-time positions at The Maritime Aquarium, Sea World, Mystic Aquarium, Georgia Aquarium, Scripps Institute and other aquariums, as well as careers in related fields, such as veterinary medicine.